Don’t miss our monthly newsletter! If you sign up at quimbys.com to get it. 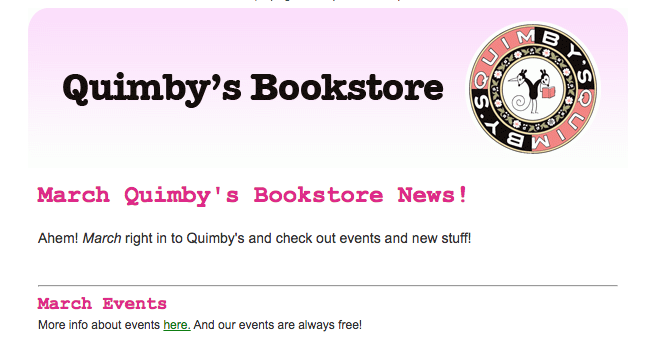 it will come straight to your inbox with Quimby’s announcements, store event listings, a list of noteworthy new items etc. Wanna see our February newsletter ? Click on the image below! UPDATE: C.T. Ballentine has been found. At 2:30 PM family members said a “disoriented and tired” Ballentine had turned up in an area hospital. They thank everyone for their help and support. Additional updates will be posted on the Facebook page. Tonight’s event at the Whistler has been canceled. CT Ballentine is an important part of the Chicago literary and zinester community, and has been selling his zines for the last five years (at least). Please — if you have any information, or could pass this information on to you and yours, it will be enormously appreciated. We are asking people all over Chicago to help find a missing friend. You may know C.T. Ballentine, a very talented artist who lives in the McKinley Park neighborhood of Chicago. He has been missing since Friday, and all of his friends are worried about him. He’s been going through some difficult times, and has recently shaved his head. As you can read in the attached email, he is a writer, sound engineer, performer and active member of the Chicago’s young artist community. We would appreciate it if you could read this, and help us put it into as many hands as possible. If you have any questions, please feel free to call Eric Graf. His number is at the top of the flyer. PLEASE READ THIS AND KEEP AN EYE OUT FOR C.T. BALLENTINE OF CHICAGO. HE IS MISSING, AND WE ARE WORRIED ABOUT HIM. He was last seeing wearing dark cut off pants over sweatpants and a jean jacket. He has recently shaved his head. There is a Missing Persons Report with the Chicago Police. If you have any information on his location please call 9-1-1 immediately. You can ask for confidentiality, if you want. PLEASE SPREAD THIS MAILING FAR AND WIDE. MISSING PERSONS REPORT: Christian “C.T.” Ballentine of the McKinley Park neighborhood of Chicago. Christian “C.T.” Ballentine was last seen at his apartment in McKinley Park on Chicago’s South Side Friday, Nov. 6, at 3 p.m.
Ballentine has likewise reviewed and profiled numerous bands from across the musical spectrum and written feature articles on a broad assortment of topics. Ballentine is an editor for THE2NDHAND, a national literary concern founded in Chicago whose website can be found at www.THE2NDHAND.com. Several literary journals have published Ballentine’s fictional work. Ballentine was the founder and publisher of now defunct Aftercrossword Special, a literary zine hilighting both fiction and art. Ballentine occasionally worked organizing for a series at Hungry Brain curated by Brandon Weatherby. Cup & String (http://www.myspace.com/cupnstring) and 1997 among many others. Tags: bestsellers, news, store news, top ten. Shout-outs to a few of the books and events which shaded my glassy eyes throughout 2007. I can totally see this book at home in some ruined castle in Lacoste.. Or Master Shake reading it in an episode of Aqua Teen Hunger Force. Either way, books such as Roy Orbison Wrapped In Cling-film are the reason why Quimby’s Bookstore is so great in the first place. Ja und was sonst? Tags: 2007, favorites, news, top ten.